The primary force act from O to P along the line of stroke. Hence, the balancing of primary force is considered as equivalent to the balancing of mass 'm' rotating at the crank radius 'r'. This is balanced by having a mass B at radius b, placed diametrically opposite to the crank pin C.
= B. w^2. b cos θ. 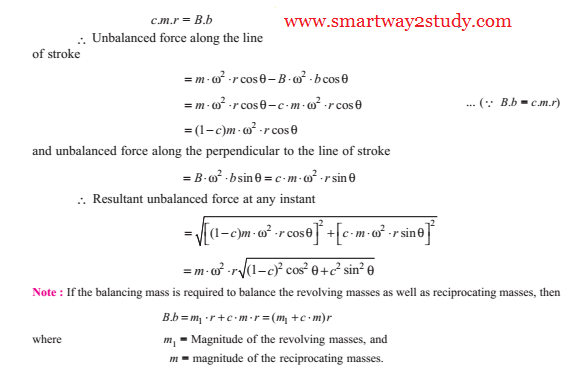 A little consideration will show, that the primare force is completely balanced if B.b = m. r , but the centrifugal force produced due to the revolving mass B, has also a vertical component perpendicular to the line of stroke having magnitude B. w^2. b sin θ. This force remains unbalnced. The maximum of this force occurs at value of θ = 90° or 270°.